On race day during my freshman year at Georgia Tech, a pilot friend of mine offered to take me flying if I helped pay for gas. He rented a Cessna 150 at the Fulton County Airport not far from downtown Atlanta. I had time in a Cessna 140, a tail dragger version of the 150, but had never flown a 150 before, so I sat in the right seat. A short 30 mile flight later we were on top of the Atlanta International Raceway (now the much faster sounding Atlanta Motor Speedway) just as the Atlanta 500 race was starting. Once there, the pilot decided to let me fly. I, like any normal young male very full of himself, decided we should race the cars. And so we did. Other planes started arriving, but we were the first ones there, and so the rest had to orbit further away from the track, while we had the prime spot for the race action – directly over the track. Although the two-seat Cessna had a cruise speed of only 123 mph, it had a Vne, never exceed speed, of 162 mph, and I found that by putting the plane’s nose down on the straightaway, I could safely race the cars at 150 mph, which pretty well allowed me to keep up with them. On the turn I threw the wing over and maintained position over the track. After the 180° turn, I’d climb back up so I’d have altitude to speed down the track on the next straightaway. We did several turns like that before deciding it was time to fly off for more adventure. And to think, I wasn’t even a pilot yet! Photo taken by Pax River Naval Airstation Photography Department. Click for larger image. Did some pilot take the word “Landing” in Landing Craft, just a little too seriously? Well, not exactly. But the story behind this photo made it into Flying Magazine, as you see below in the “Ship to shore” piece. It was February 1975, and I was an active duty First Lieutenant in the Army stationed at Aberdeen Proving Ground, Maryland. I had flown our 2-seater Cessna 150 from Southwest Georgia (Thomasville) up to Aberdeen, MD in January. After a 734 mile (each way) flight home for the weekend of February 8-10, I could not resist flying myself and another Lieutenant back home for Valentines Day (Feb.14) since the following Monday was a Federal Holiday, President’s Day. The fact that my wife and I were trying to start a family made a Valentines trip all that more appealing. 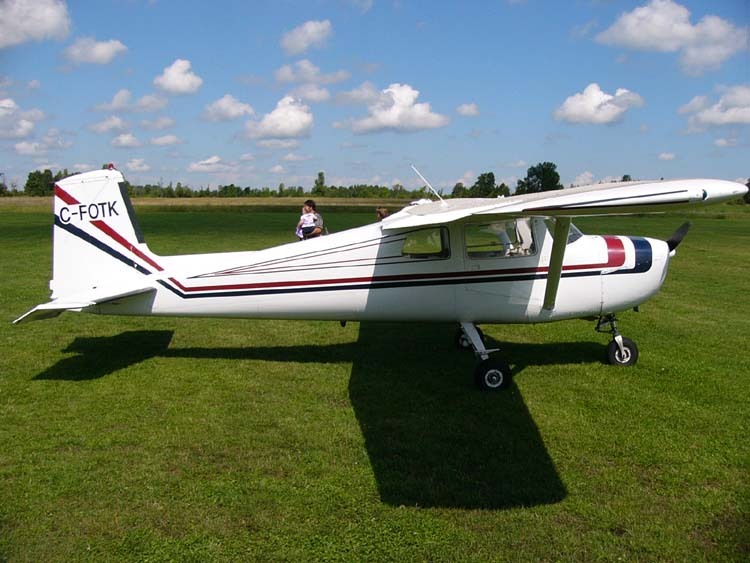 My aircraft was a 1962 Cessna 150B, the fastest stock version of the 150 with a reputed 109 knot (125 mph) cruise speed. Therefore, the round trips were challenging but doable for a 232 hour pilot with 10 hours of instrument training. All was well until the return flight on the 17th. The weather briefers claimed that a front was moving from west to east across my path of flight, but as slow moving as I was I should be flying up the backside of the front, in the clear, as I made my way up north. Naively, I put too much faith in their forecast. It was what I wanted to hear. After picking up my friend at Peachtree DeKalb Airport, outside Atlanta, we set off on the long leg back to base. On refueling and reassessing the weather in North Carolina, things were looking bleak. The front had stalled, and was not moving through as projected. It appeared that some “scud running” would be required, at least for a while, but I wasn’t sure I wanted to risk it. But then again, we really wanted to get back to the Army base. The Army would not be happy if we didn’t show up the next morning. A more experienced pilot I had been talking to at the air field in North Carolina took-off with the intention of following roads. Well, if that was good enough for him, it was good enough for me. We departed again, and were soon flying just below the clouds over endless farm land, far from towers or anything else that could reach up and smite us. Except for the flock of Canadian geese doing the same thing. I’m not sure who was more surprised as we came together out of the mist at well over a hundred miles an hour, them or us, but thanks to quick reactions and animal instincts we all survived the encounter without so much as a feather lost. It was then that I decided to climb on top of the clouds at the first available opening, just to see what I was facing. It was gorgeous on top of the cloud layer, with bright sunshine and endless visibility, and white clouds stretching from horizon to horizon. I was flying “VFR on top”, and with the added altitude my single VOR navigation radio was able to pinpoint my location at all times. I no longer needed to follow roads. The only problem was, getting down, eventually. As we motored on, I developed a plan. I had already intended to fly east of Washington D.C. , over the Chesapeake Bay, before heading straight for Aberdeen, MD, north of Baltimore. 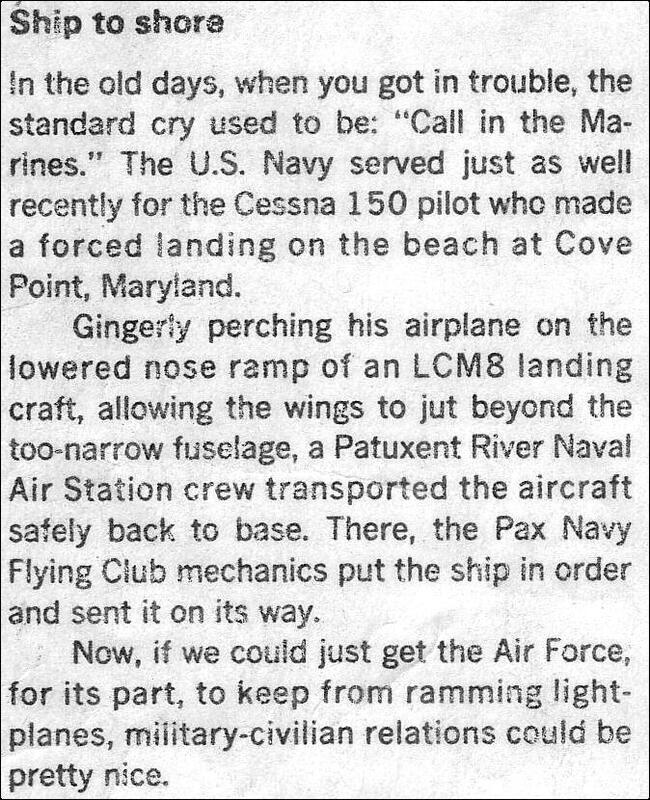 But now the plan was to navigate above the clouds to the center of the bay, and hope for the best, staying just north of the airspace around Paxtuxent River Naval Air Station (PAX River). If things didn’t look good for the run up the bay, I’d land at St. Mary’s County Airport in Leonardtown , MD. When our navigation radio said we were directly over the Bay, a hole opened up large enough for us to spiral down towards the water. But once under the clouds I realized I had little choice except to land at St. Mary’s airport (2W6), which, according to the chart, was only about a mile from our location. The option of scud running up the Chesapeake would have vanished about the time I reached the Chesapeake Bay Bridges. Flying under them would not only have been illegal, it would have been stupid. The only problem was, St. Mary’s County Airport was not where the chart said it would be. Well, my passenger was not too keen on what I had in mind, so unwisely I gave up that opportunity and crossed to the east side of the bay continuing to search for the airport. Soon I realized it was not there either, and started a 180° turn back to the west. Unless a pilot is extremely careful, he can lose some altitude during a large turn. During my turn I lost 50 feet, which is not bad, except for the fact that I’d started the turn about 100 feet above the water. That dip towards the water definately got my passenger’s attention, and I think from then on he was willing to accept whatever method of safely landing that I could manage. Once I was headed west across the bay again, I found the clouds had dropped to the top of the Calvert Cliffs. The option of putting N1144Y down in a field on top of the cliffs was now gone. I was now committed to landing on a beach that would hopefully be flat enough and wide enough for my plane, whether my passenger liked it or not. If only I could find one. 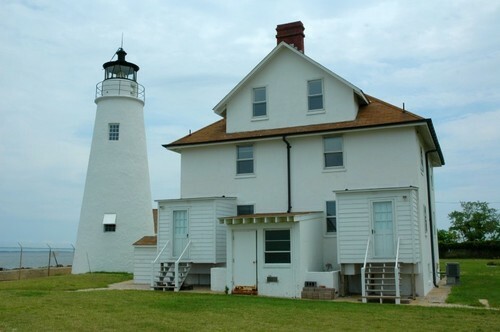 Then, almost miraculously, 4000 feet of suitable landing room appeared just north of Cove Point. I took it as an invitation to end part 1 of the saga. View out the windscreen just prior to touch down. In my excitement during manuevering for landing, I forgot to lower my aircraft’s flaps, which meant I approached the beach faster than intended, and my roll out was longer than it should have been. Just before rolling to a stop the front wheel hit a one or two inch berm in the sand, which sent the plane rotating up onto its propeller spinner, tail high in the air. In the cockpit we were staring down at the sand, which seemed strange, but at least we were stopped, and none the worse for wear. We hopped out of the plane, and pulled the tail back down level, so it didn’t look so much like a plane crash. Just then, we saw a squad of men running up the beach with stretchers, thinking there had indeed been a plane crash. The report of a crash had been radioed in by men on a boat who witnessed the approach and landing from out in the increasingly foggy bay. After the initial excitement died down, we were invited to spend the night in a Coast Guard Station, on whose property we were now trespassing. But since we were both Army officers, we were treated like fellow brothers in arms. It was my intention to take off again the next day. The beach was firmly packed sand, a very decent soft field, and after all, we pilots practiced soft, short field takeoffs and landings. But we got word that the FAA was planning to visit the site to “approve” the take-off location. Unfortunately, it took a couple of days for the FAA to arrive due to, as they said, a number of plane crashes that foggy day. So I guess I’d been lucky to find a suitable location for a precautionary landing. But getting off proved to be a challenge since by the time the FAA arrived the beach had dried and become too soft. They would not approve my takeoff. Two plans presented themselves. One, a team of mechanics would descend on the beach and disassemble the plane like ants carving up the carcass of a downed dragon fly, carrying off the pieces. Or sailors from the nearby Paxtuxent River Airstation would put a sling around my still airworthy bird and a large helicopter would hoist it into the air, depositing it on the Pax River runway not too far distant. That was not what I was hoping to hear. The final plan was pieced together by Navy base personnel who were accustomed to using Landing Craft to recover the remains of crashed test aircraft. And my little bird sort of fit that description. They called it a training exercise. One morning early I was guarding the aircraft when I saw the LCM get as close in as it could to the beach, and then a bunch of sailors charged out of the open front ramp of the LCM like Marines at Guadalcanal. Strong hands and arms then pushed the plane backwards down the beach, and then up into the open bay of the craft. The nose wheel rested on the downward sloping ramp, which would have placed the wheel in saltwater as we slowly motored across the Bay towards Pax River Air Station. That problem was solved when I gently sat on the tail section (the horizontal stabilizer) to raise the nose wheel out of the water. Luck was with us as the water that morning was glassy smooth as we motored the approximately 6 miles or so to the Navy airfield. The LCM nudged up to an old sea plane ramp, and myself and several sailors pushed the Cessna up the ramp to a flat portion of the Pax River runway. From there, I taxied the plane to a maintenance hangar where we spent most of the night going over the engine and airframe with a Pax River flying club mechanic to make sure the aircraft was still airworthy. The next morning I took off from the longest runway I had ever seen, flew a salute around the Coast Guard Station that had been so accommodating, then flew on up the Chesapeake Bay to the air field at Aberdeen Proving Ground. I could never, in a single lifetime, repay my debt to both the Coast Guard and the Navy for their assistance on one long flight gone wrong on a cold February day. If you are one of them, reading this now, know that I am eternally grateful. You are one of the reasons I’ve spent my professional career working for the Navy. And the FAA? When I reported that I was attempting to locate an airport that was incorrectly charted, I never heard from them again. Fortunately, airport or not, I was able to make a good decision before I ran completely out of options. A precautionary landing beats a crash any day. Three years later I completed my instrument rating so I would never again have to repeat such a potentially dangerous experience. The following photo shows 1144Y with a fresh coat of paint, and with a baby boy born nine months after that Valentine’s day flight.